We all know work can be stressful, frustrating, and anxiety provoking at times! As well as taking a toll on our psychological wellbeing these challenging emotions are one of the biggest causes of overeating! In this Thursday Therapy, I give you my 5 best ways for coping with stress in the workplace without the need for comfort food. From massive workloads to micromanagers, bullying to burnout, learn how to cope with work stressors and find calm in healthy ways. Hey, everyone. It’s Glenn Mackintosh, The Weight Psych. 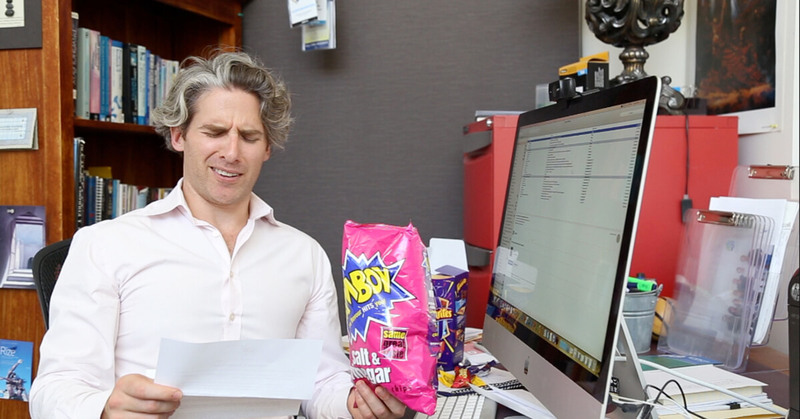 Today we’re talking about managing work stress without turning to food. Hey everyone. I hope you’re doing well. We’re doing really well, and, you know what, it’s really cool to be getting all of your emails and messages back. We feel like we’re really developing a special relationship with you guys. It was really cool, we’ve had the first person ever to say they’ve binge watched Thursday Therapy, so that’s kind of cool. The other thing that’s been really cool recently is that I’ve done a couple of blogs on body image, one on the psychological cost of your body image, and one on how body image affects your physical well-being and weight management. The response has been overwhelming. We’ve had over 20 emails back saying, “Glenn, it’s like you’re in my head. Thank you for putting words to my whole life’s experience.” We’ll make sure we’ll provide you with the links to those blogs just in case you’ve missed those. This is a really good question Cassie, and thank you for letting me use it. Guys, Cassie originally asked this question to our online support group, and we’ll provide the link to that if you want to be a part of it. I said to Cassie, “This is such a good one, can I answer it on Thursday Therapy?” She said, “Yep. No worries.” Thank you, Cassie, for that. It is one of those questions that I think, “Why haven’t we answered this one before?” Because I’m talking about this all the time. Let me give you my five top tips. The first thing that I want you to think about is, if you can, just taking some regular breaks. This is really important. Sometimes your brain just needs a breather to de-stress and unwind. This is like what a smoker might do regularly, they go out for their smoke break, and it’s partly about the cigarette, but it’s partly about just being away from work, being in a new environment, and maybe having a chat. I want you to think about ways you could have a little break. It might be you go for a little stroll or a walk in the sun, or just sit in the sun. It might be, if you can’t actually get outside, just taking a little breather and looking at nature. Some non-screen time break is probably better than screen time break. I like to just look out on my balcony and just stare at the trees for a couple of minutes. You might go and have a chat with someone. If you do, I would recommend having a chat to distract yourself rather than complaining, because sometimes complaining about the office environment can just get you further embedded in unhelpful beliefs, so it reduces the stress a little bit but propagates beliefs that don’t actually help you reduce your stress in the long term. Whatever you do, I want you to have a play and think about taking a break in a way that’s right for you. The second thing I want you to think about is that sometimes we just need to put something in our mouth. We learn to sooth our emotional discomfort when we’re feeding when we’re young, or when we’re given a dummy or a pacifier in that oral stage of our development. That habit can just stick with us. For some people it might be biting your nails or smoking cigarettes or eating, but, of course, it doesn’t have to be. You can think of if you would like to do something else, and put something else in your mouth. I have my concoction that I call work juice, and it gives me a bit of energy to keep going. It helps me feel comforted while I’m doing tasks. It’s a mix of San Pellegrino water, a big square ice cube and a Berocca, but yours might be a cup of tea or a glass of hot water, or a coffee, or anything else. It could also be that you have a mint or you chew gum, or anything else just to put something in your mouth. It could be something like a stick that you twirl around in your mouth, or one of those hard-boiled lollies that just takes ages, and ages to chew. I want you to have a play around with that, and you might find that it’s surprisingly useful. You may decide that there are some work situations that you can just make peace with. The reality is, of course, that no workplace is perfect, and getting a little deeper, the world is a chaotic place, and it’s not designed to be fair or to be exactly as we want it. You may decide if there are regular, little reoccurring things that stress you out that you can just let go of some of those pet peeves. For example, Emma and I run a fairly busy psychology practise, and about a year ago we decided that client cancellations weren’t going to stress us out. We weren’t going to get stressed out that we really wanted to help that person. We weren’t going to get stressed out that another person would want to come in at that time and could have come in, or anything about the financials about it. We just decided, you know what, this is part of running a service practise. This is part of what we do, and we could just make space for it, and it’s just not worth our energy. If you find it hard to do that, a psychologist can definitely help you here. You might decide that there are just some things you can just decide that are not really worth your energy. If you find any of those, whatever format you’re watching this on, I’d love you to comment below. Of course, sometimes you need to look at solving important work problems. Some problems are so big that you won’t be able to just cope with them in other ways. You won’t be able to think your way around them. For those ones you really need to look at what’s giving rise to all of those unpleasant feelings, and look to resolve it. Guys, I couldn’t not give you this tip. I really want you to try all of the other tips, but if, for example, you’re working 75 hours a week, it’s unlikely that those other strategies are going to do you too much good. I really want you to think about if there’s any problem that you can solve. When you do, you might go through your own problem solving process by yourself where you look at what goals you have, what you want to get out of the situation, what are the barriers, brainstorm some solutions, and then decide upon them, and then review that. Often, these issues happen in the context of other people, so you might need to have a conversation with a work colleague, or one of the staff members there. It might need to be a deeper conversation. If you need to have that conversation, I’d encourage you to try your best to leave past grievances behind, really listen to the other person’s side of the situation as well. Practise that active listening, and try and be really assertive and look for a situation that works well for everyone. Of course, that’s not always doable, so you might need to look to do some mediation with an external party or someone else in there at work. If you do, again, I’d really encourage you to look for the win-win in the situation. Trust me, as a psychologist who does mediation from time to time, that makes the process a whole lot easier for everyone. The last thing that I want you to consider, and it’s probably good that this is last, because it is a bit of a last resort is that you might need to leave. That might involve taking a little break or a long break. That can be really good if you’re feeling like you’re a bit stale or burned out. The treatment for burnout is actually having a pretty lengthy break, so that could be possible. It might be time to move on, so you could move within the organisation or to another organisation, or it might be time to switch your entire career, or even retire. Now, these are really, really big questions, but, again, I couldn’t not say this. I can’t count the amount of times I’ve had someone’s eating magically improve, and even some people who had been working on it and not getting the best success for a while, and it just changes overnight when there’s a significant change to their work situation. Please don’t run out and quit your job tomorrow, but if you’re really deep down feeling like this might be something that you need to do, with a bit of creativity, sometimes some extra study, some forethought and a lot of bravery this can be truly transformational. Okay, guys, so there’s my five best tips. I’ve done them in ascending order, so you might want to have a play around with them in that order, or whatever order you choose. Again, thank you for all your wonderful, heartfelt comments. We’re really loving giving you a little boost every couple of weeks, and even more so if you’re on our mailing list. Don’t forget to check out our blogs. Don’t forget to join our group for extra support. Of course, if you liked it, let us know. We’d love to hear your comments below. This is one that a lot of people will find a challenge with from time to time. This could be a really good video to share with your friends. Until then, you have a stress-free, and have an experimental time playing around with those ideas, and I’ll see you at next Thursday Therapy. Hey Buddy!, I found this information for you: "EPISODE 39 Dealing with work stress (without turning to food!)". Here is the website link: https://www.weightmanagementpsychology.com.au/episode-39-dealing-with-work-stress-without-turning-to-food/. Thank you.